After responding to the Kentucky Beverage Association’s “Don’t blame soft drinks for obesity” letter, my thoughts turned to the Academy of Nutrition and Dietetics (AND) taking money from soda companies. The AND claims to be the public’s best source for the most credible food and nutrition information but that credibility is diminished when it uses its platform to support soda companies. What could AND be doing instead of promoting Coca-Cola? Here are some inspiring examples of individuals taking action and getting results! 5th graders in Lexington, KY have started the Candy Act, a petition asking their principal to make it against the rules for teachers to use candy as a reward. If they succeed, they plan to ask the superintendent to expand it to the entire district. A father got California Pizza Kitchen to agree to remove “Pepsi” from its kids menu word search. A soccer mom spoke out against a soda company marketing to children at the practice fields. Another mother got the snack for an ice skating class upgraded from candy to fruit. Imagine the impact on public health if AND chose to follow these examples and put their integrity ahead of their financial interests. 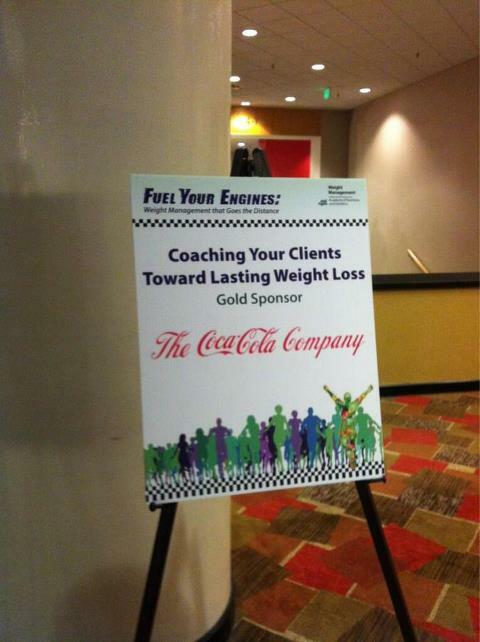 I hope future generations will look back at the picture of Coca-Cola as a “gold sponsor” for the AND’s Weight Management Dietetic Practice Group’s symposium just as I look back at the American Medical Association taking money from tobacco companies. It’s time for AND to stop being part of the problem. Tags: AND, Coke, soda, sponsorship. Bookmark the permalink.